Please note: Our SMS system is only available within Australia. Group SMS messages can be sent from your smartphone using 'Mobile Communicator'. 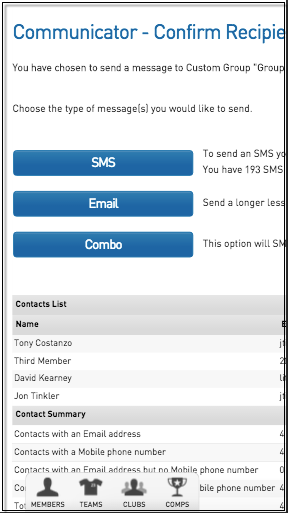 Before Mobile Communicator can be used, you firstly need to set up an SMS Sender Account and purchase SMS credits through SportsTG Membership. 1. Ensure that you have set up an SMS Sender Account and purchased credits through Membership. 2. Open the Internet browser on your smartphone and go to passport.SportsTG.com and log in to your database. 3. 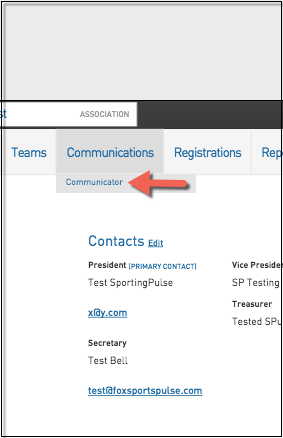 Hover over Communications and click Communicator. Membership Group - select members based on their member type (players, coaches, umpires, officials), select administrators from the club contacts, and/ or select team contacts. 7. 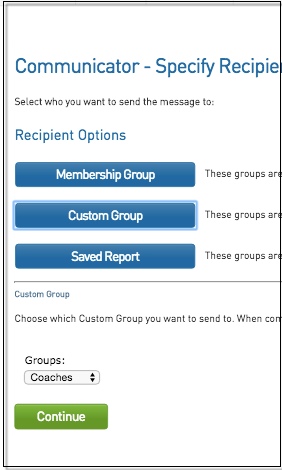 Depending on the recipient option that you have chosen (Membership Group, Custom Group or Remembered Report), a number of options will appear. For example, if you have selected Membership Group, you can now choose from players, coaches, officials, or club contacts. If you have selected Remembered Report, you can choose from your list of saved reports. Click on your preferred option. This screen will also inform you of the credits remaining in your account. So long as you have sufficient credits to proceed, click on Continue. 9. 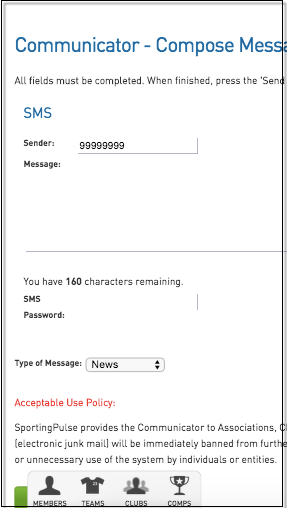 Compose your message (maximum of 140 characters) in the 'Message' text box. 10. Enter your SMS account password in the 'SMS Password' field. 12. A confirmation screen will appear when your message has been sent successfully. Important: SMS credits are not refundable.